Tupper was called one of 2009’s sexiest stars by the American magazine US Weekly and recently included in the US TV Guide’s list of “Sexiest Men on TV,” is the first Canadian celebrity to endorse the Bay of Fundy. 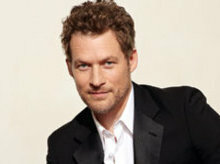 James Tupper is also well-known to TV audiences in North America and beyond for his role as “Jack” alongside his real-life partner, actress Anne Heche, in NBC’s “Men in Trees”, and for his guest appearances alongside Christina Applegate in “Samantha Who?” His most recent movie, the screen-adaptation of the bestselling novel “Me And Orson Welles” was released in December 2009, in which Mr. Tupper stars opposite Zac Efron and Claire Danes. He currently divides his time between Los Angeles and Vancouver. New7Wonders is delighted that James Tupper is helping spread the word about the campaign to choose the Official New7Wonders of Nature. People worldwide are coming together to celebrate what Mr. Tupper calls the ‘extraordinary natural wonder’ of the Bay of Fundy and the other 27 Official Finalists.